Directions (1 – 5): Study the following bar-diagrams carefully and answer the questions given below it. 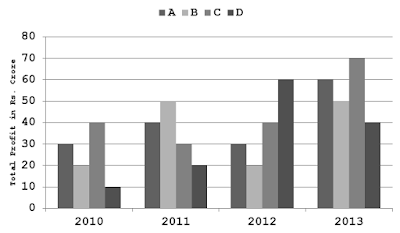 Table shows the percentage profit of four cosmetics companies during the four years 2010, 2011, 2012 and 2013. 2. What is the sum of the incomes of all the four companies in the year 2013? 3. The total profit of all the four companies in the year 2010 is approximately what per cent of the sum of their expenditures in the same year? 4. What is the ratio of the sum of the expenditures of Company B during all the given years to that of Company D in the same period? 5. What is the ratio of the sum of the income of Company C in the year 2011 and 2013 together to that of Company A during the same period? Directions (6 – 10): Study the following pie-charts carefully to answer the questions. 6. If Rs. 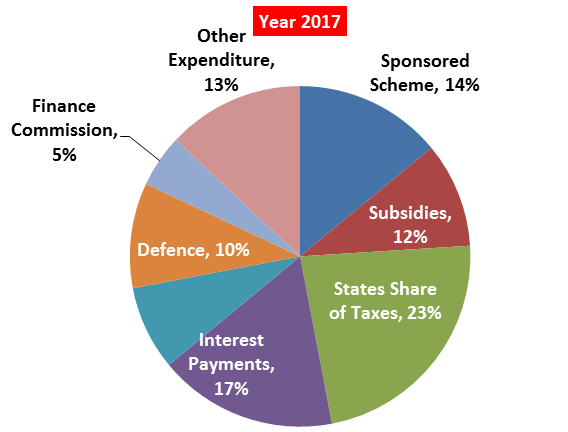 126 billion was spent on the ‘Finance Commission’ in 2016, the amount spent on ‘State share of taxes’ is what per cent more than that spend on ‘Defence’? 7. 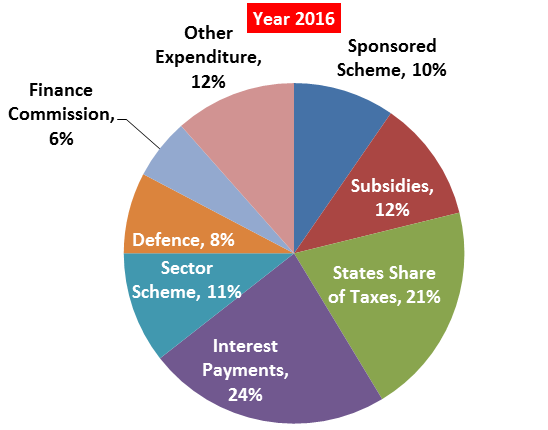 If the ratio of money spent on ‘Sector Scheme’ 2016 to that of 2017 is 32 : 33 and the amount spent on ‘Sector Scheme’ is Rs. 396 billion in 2017 then what is the ratio of the money spent on ‘Sponsored Scheme’ in 2016 to that in 2017 (in decimal)? 8. If the total money spent in the year 2016 and 2017 was Rs. 850 billion and Rs. 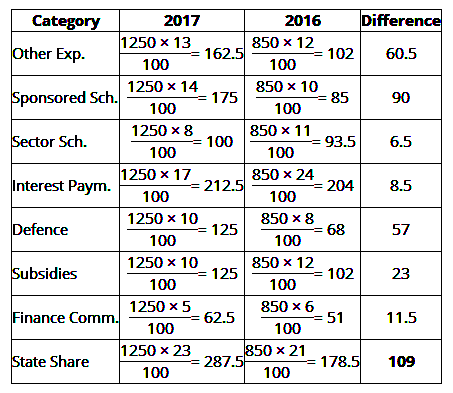 1250 billion respectively, which group of category shows the maximum difference between 2017 and 2016? 9. If 84 billion was spent on ‘State share of taxes’ in 2016, the amount spent on ‘Subsidies’ and ‘Sector Scheme’ together is how much percentage less than that on ‘Defence’ and ‘Interest Payment’ and ‘Finance commision’? Hence, the maximum difference is Rs. 109 billion in 'State share of taxes'.